I find your weekly comments very helpful. Two items I find note worthy. 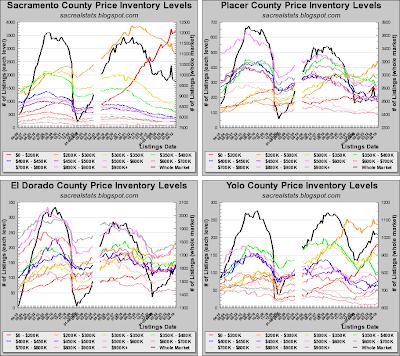 The first is the emerging new pattern in the 4 County total inventory level. 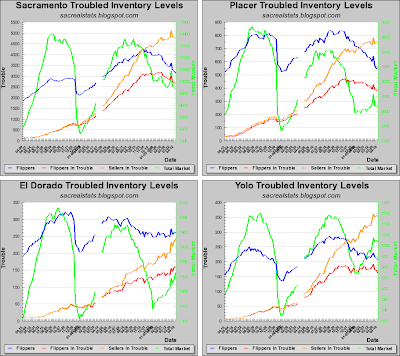 Inventory is not following the past seasonal trend. Something is very different. 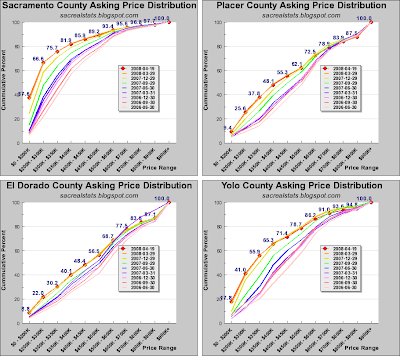 The second item is the rapid shift in Sac County asking price distribution between 6/07 and 3/08 (blue curve to dark orange). Although it is still shifting it seems to have slowed down. 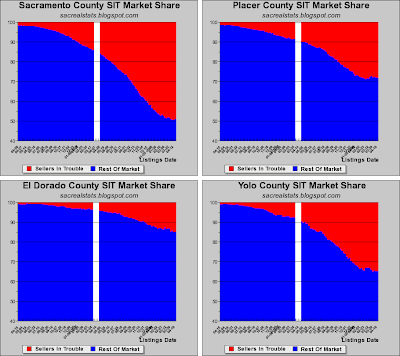 Put that together with agentbubble's data showing REO's now dominate sales and it appears that we shifted from a SIT market dynamic to an REO dynamic over the last 6 months. 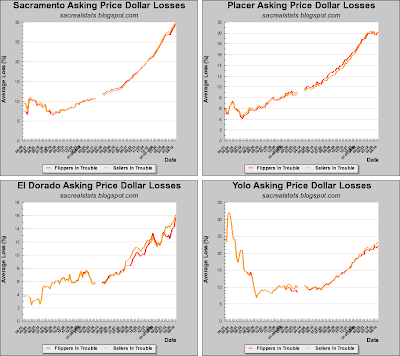 I wonder if REO's went from around to 10% to 60% of the market in that 6 months? Until the REO's stop piling in so fast (1 year?) REO's will drive the changes. 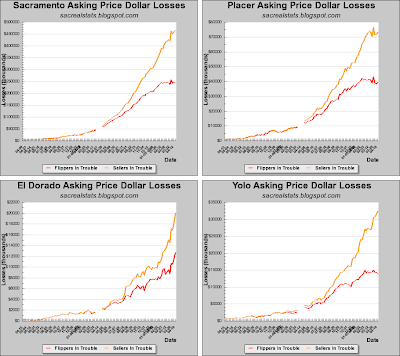 I wonder if we have ever had a Sacramento market dominated by REO's? This might explain why even the Home Depo'and other retailers have seen a new pattern emerge over the last 6 months. What would be interesting to hear is from a forward looking banker type or a banker mole. If bankers are going to be driving this bus for the next year it would be good to know what they are thinking. Any bankers out there? 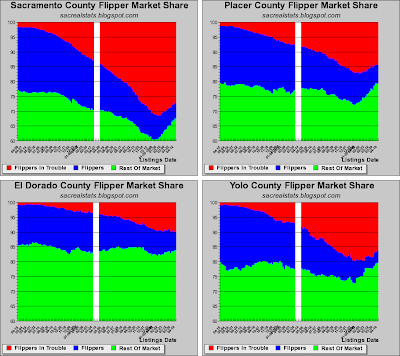 I agree with your bifurcated market discussion. 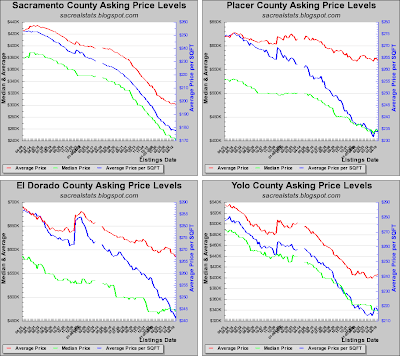 If it is correct I believe you are predicting the rate of decline in prices might slow. 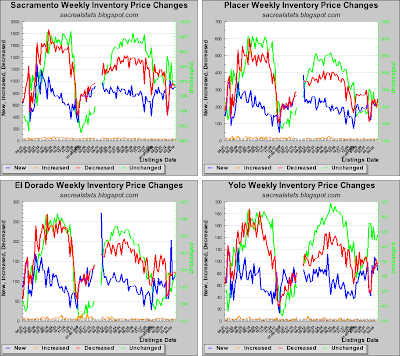 That is prices will decline but not as fast as they have in the last 6 months as we moved from SIT to REO dynamics. The bottom is still far away but we needed a change. These are interesting times. Looked at a house yesterday. Talked with the listing agent and from what she said, this house was going to sit and sit because of pricing. The asset manager is firm on the price but if you factored in just the repairs to bring it to code (where Mort Insurer would even think of backing the loan), it would have outpriced the neighborhood as it stood with wishing prices now. The asset manager hadn't even ordered a building inspection and the agent said she wouldn't either because she wouldn't get reimbursed for it. So 200k house that had been trashed and needed about 50k in structural and electrical work, including removing about 200 sqft of a non-permitted addition, in a neighborhood that would comp at 210k now for a bigger home. However she said she might be able to get the bank to come down to about 185k. Bank will only give 7 days to inspect. So I guess what the bank is doing here is hoping someone will bite and they'll run out of time to get the inspection done if they drag their feet or they are just waiting for some spectulator to come by and spend the 400 for them because the holding co just can't be bothered. It was an interesting hour for us but it showed us how far things still have to go down. I had a similar experience last month. I offered $75,000 for a "1500" sf house in Lincoln at 290 E 10th (MLS # 80031582). It was listed at $250,000. The City of Lincoln made PG&E remove all utility meters, since the property was a squatter hang out. The garage was built 2 feet too close to the eastern boundry, then converted to a living room! The city insists it needs to be torn out. A structure was built over a sewer utility easement in the back yard. Bottom line: The house needed $40,000 in repairs, to make it into a 1200 SF house. Comps said $130,000, once it is fixed up. Rental multiplier indicated $115,000 after repairs. I have a son returning from his second tour in Iraq for whom this would make a nice constructive project (instead of blowing sh!t up, he could fix sh!t up). The bank would not even counter my offer, although they have now lowered the price three times (currently $187,400). Nice touch, that extra $400. It almost makes you think the bank knows how to skinny down the price to make an attactive sale. There is only one problem: To get PG&E to turn on the utilities, you need to visit the Lincoln City Building Department. They will tell you to tear down part of the building and use a generator to power your repairs, before you will be approved for a power supply. Then you can see if the toilets flush and the heating system and stove light up. Deutsche Bank lent $210,000 on the POS in 2004!! I will wait until winter and offer $65,000. I bet I get it then! I keep offering less on houses when my offers are rejected. So far, I have purchased two that way!! It has saved me $70,000 so far. 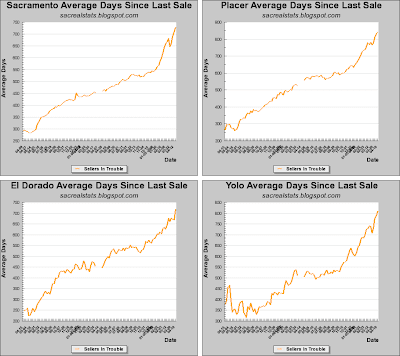 I know of 2 investors who have been very active in the Sacto market. One has bought 12 homes in the last 2 months, the other has purchased 4. Both are looking at REOs under $100 a square foot. All the homes they've purchased have been in Elk Grove and area's slighly north (sorry, not too familiar with the area). They have been putting 20% down and all the properties are cash flow positive. They both reconize they might be early, but they plan to wait it out and they would rather be early than late. Sounds like a good strategy, except for the being early part. If you own 12 houses and the market vacancy goes to 20%, you will be very cash flow negative. Rental rates are dropping, vacancy is rising and there are many, many more homes on the way. Of course buying under $100/sf is below reproduction cost, so it is hard to get hurt if you have reserves. I think these inefficiencies are what you'd expect from a bank. They're used to dealing with predictive pricing models, (that's how they got into this mess in the first place. :) so they don't know how to deal with "special cases." Until a real human reviews the actual file, these properties will sit. This could lead to panic buying in no time. FWIW, I've been to Costco recently and they seemed to have plenty of rice and flour. 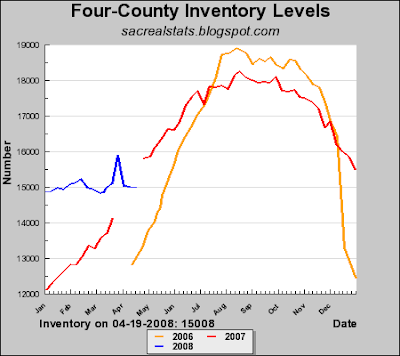 I have heard of rationing taking place in the northern Sac Valley (Redding). I went in knowing it was going to be a fixer. The agent braced me to be expected for bad. Apparently the place had been used as a flop house for migrant construction workers (we talked to the neighbors). The bank was basing the price on a sqft that included a 250 sqft addtion that was well shy of code. The wiring for the entire place was on a 1960s harness. In some places, they just used entension cords and then plastered over the junctions. Running a blender and a blowdryer at the same time would have fried it. The best part is where they installed a huge sump fan into the opening for the attic crawl space. This was the first really bad REO I'd seen. Most of the REOs I had toured need mostly cosmetic help and just some love. The bank, Premier Lending I think it was, clearly has no plan to realistically sell this house. It will come to no surprise that we crossed this off the list. They both reconize they might be early, but they plan to wait it out and they would rather be early than late. I wish I had a relationship. Both of these guys are worth a min of 5MM. One owns 6 fast food franchises around the state and makes a boat load from them. The other is a VP at a major tech company. Neither live in Sac, one in LA and the other in Vegas. I echo your feeling, I think they are early and it's going to be longer than 5 years before the market comes back. They counter that they're dollar cost averaging in. They know this might not be the bottom, but houses are not stocks, you can't just submit an order through your broker to buy 50 all at once. They figure they'll be looking for deals over the next 12-18 months. "I think they are early and it's going to be longer than 5 years before the market comes back"
8 years after the dot.com implosion and the NASDAQ is still at 50% of the high. 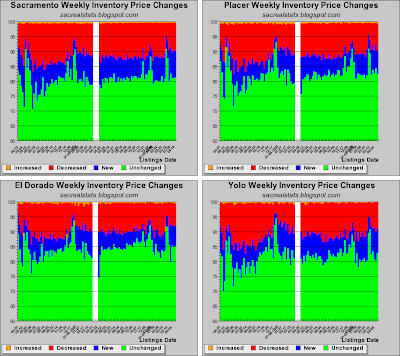 Just an FYI to those who expect housing to go up to the levels they were in 2005. I don't think we'll see those home prices anytime soon, and maybe never in my lifetime.